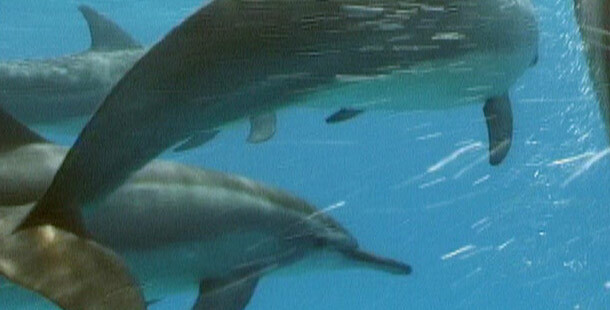 For seamen serving in the South Pacific in World War II, dolphins were a curse — and a cure. The sleek, acrobatic marine mammals would often gather at the bows of steaming ships, surfing and playing in the bow wave — and giving war-weary sailors some entertainment. “For a few moments, we could forget all about the war,” one American veteran recalls in NATURE’s WAR WRECKS OF THE CORAL SEAS. But dolphins could also cause a scare. At night, the powerful swimmers could stir up light-emitting plankton as they raced to meet a passing ship. The streak of light they created looked an awful lot like an onrushing torpedo, and many a sailor had a few panic-stricken moments before they realized the curious dolphins posed no threat. 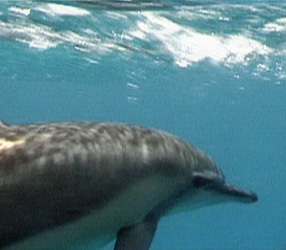 Dolphins have been enlisted by the Navy to guard ships and search for mines. Today, dolphins relate to the U.S. Navy in a whole new way: they’ve been enlisted as important allies in guarding ships and searching for mines. Since the late 1950s, the U.S. and other nations have experimented with using dolphins and other marine mammals, such as sea lions, for military purposes. Part of the interest stems from figuring out how these animals can swim so fast and dive so deep and perhaps borrow their secrets to build better submarines and ships. But military planners have also been interested in using the animals to undertake risky or difficult missions, such as underwater mine detection, retrieving objects from the ocean floor, or sea guard duty. Dolphins have proved adept at such tasks. They are smart and relatively easy to train, and in its heyday, the Navy’s dolphin program boasted more than 100 animals. They weren’t used widely, but many did see service in the Vietnam War and the Persian Gulf War. More recently, several Navy dolphins helped find, mark, and clear mines from a key port during the war in Iraq. Sometimes, the dolphins are then asked to mark the mines with a buoy or electronic tag that they carry with a special “nose cup.” Other times, the handlers simply mark the mine’s location on a map and move on. Anti-mine teams will later detonate the device. When they are not on mine duty, dolphins can also accompany divers, patrol anchorages in an effort to spot infiltrators, or guide ships through hazardous waters. Deep diving sea lions can also take on some of those tasks, aided by special gear attached to their bodies. To order a copy of WAR WRECKS OF THE CORAL SEAS, please visit the NATURE Shop. Online content for WAR WRECKS OF THE CORAL SEAS was originally posted May 2003.